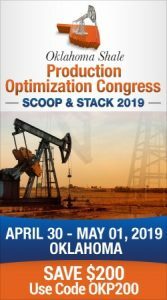 Oklahoma’s STACK continues to give up its oil with Oklahoma City-based Chesapeake Operating LLC reporting three new completions in Kingfisher County. (see OK Energy Today.) 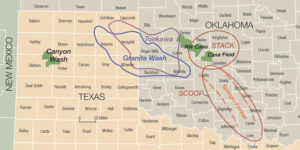 But there’s growing interest in oil exploration in northwestern Oklahoma. The wells ranged in production from 535 barrels of oil daily down to 384. The two Foster wells, located at 31 17N 5W northwest of Cashion were the largest….one producing 535 and the other 523 barrels daily. Gas production was in the 300 to 400 Mcf range. The third well, 31 19N 5W is southeast of Hennessey and produced 384 barrels of oil daily along with 1,186 Mcf of gas. Its completion date was in February of 2017. The two larger wells were completed in March. While they were not massive wells as those reported in previous months, the three Chesapeake wells are an indication of the growing interest by developers in the STACK. The latest list of permits to drill shows five approved for Ellis County to the west of Woodward. Four went to EOG Resources Inc. While the Houston, Texas based company recently announced record production in the Permian Basin, it has set its sights in far western Oklahoma around the towns of Arnett, Shattuck and Gage. The four wells will apparently be on one pad at 12 17N 24W. The fifth permit issued in Ellis County went to Fourpoint Energy LLC, a private exploration company founded by the leadership team of Cordillera Energy Partners after the sale to Apache Corporation in 2012. Fourpoint is headed in Denver, Colorado and has three field offices in western Oklahoma and the Texas Panhandle. Two permits have also been issued on the other end of the state. Bravo Arkoma LLC, based in Tulsa obtained permits to drill in Pittsburg County. Both are located at 28 3N 13E which is southwest of the town of Kiowa.